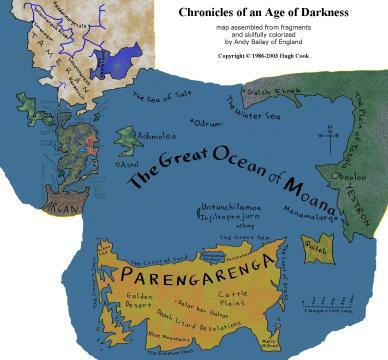 The maps above are for the CHRONICLES OF AN AGE OF DARKNESS series, all ten volumes of which were published in Britain. Some volumes were published in North America, including WIZARD WAR. THE WITCHLORD AND THE WEAPONMASTER. Hugh Cook's comments on the CHRONICLES OF AN AGE OF DARKNESS and other novels are online - bibliography Hugh Cook's novels. Hugh Cook's ten-volume CHRONICLES OF AN AGE OF DARKNESS series was not the last thing he wrote ... there are some free stories online. In 2003, Hugh Cook began working on BAMBOO HORSES, a novel.